I didn’t have piñatas at my birthday parties as a child growing up in Michigan. It wasn’t until I gave birth to two native Texans that I caught wind of this potentitally treacherous trend. I actually purchased a few of these perilous paper-mâché repositories for my daughters’ birthdays over the years, unwitting parent that I was – back then. 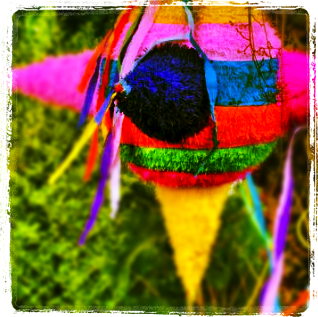 According to this web site, “every 47 minutes there is another incident of piñata-related violence.” Even respected writer Dave Barry has spoken out against the pitfalls of piñatas. It’s only a matter of time before they make it onto the ever-vigilant Stephen Colbert’s Threatdown list. sending gobs of goodies flinging! seems unwise (to put it mildly). to kids clamoring for candy? This entry was posted in Growing Pains and tagged children's birthday parties, mom humor, motherhood, pinata, Stephen Colbert, Threatdown, well-versed mom. Bookmark the permalink.